I do love to repurpose! When I receive holiday greeting cards I enjoy them for the holidays on my mantel; then, look through them to find meaning, colors, designs that I want to cherish for the whole year. I was excited to see that Patience Brewster feels the same about cherishing the holidays year round! If you’re not familiar, Patience is an artist and designer of unique ornaments and figurines. And, I put parts of the cards on my yearly Vision Board using the principles of Feng Shui. I bless and release those cards that I will not keep, thanking the senders for their thoughtfulness. Here are some examples of how and what I re-purposed this year. I hope you consider doing this to keep special holiday mementos on your Vision Board. Vision Boards can be arranged however you like. You might use the principles of Feng Shui Bagua as you lay out the board. I enjoy using repurposed materials with special meaning. — background was an envelope I liked that contained a greeting card. 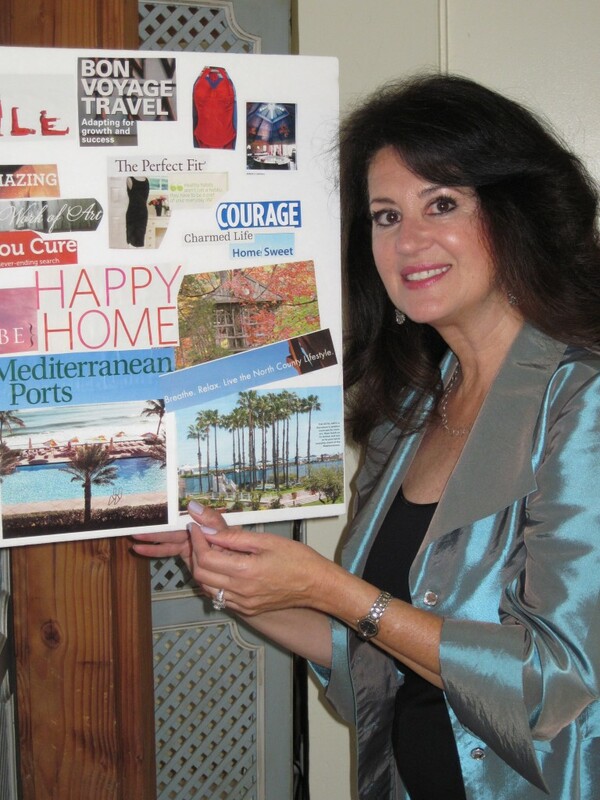 Adding your own photo increases the power of the Vision Board. For example, in the Vision Board above that is my head on the body wearing that red bathing suit. That is not my body — I do want a red bathing suit! Tried for one last year and going for it again. Keep on trying! There’s a long-standing Harvard study that proves the efficacy of writing your goals. 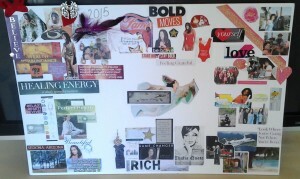 Some people prefer creating Vision Boards instead of (or in conjunction with) written goals. Thoughts are things. What you visualize becomes your reality. I would love to see your Vision Board and I wish you all the things you put on your Vision Board this year! Vision Boards can be arranged however you like. I used Feng Shui to lay out the board. I save my boards. It’s fun to review them and see what has occurred through the power of visioning.